Manufactured housing, once a neglected sector of the real estate market, is starting to pop up on the radar of real estate managers. Managers like manufactured homes, also known as mobile homes, because they can earn a value-added return by converting some of the parks to institutional ownership; they make improvements, increase income by raising rents and create portfolios that can be sold or spun off into real estate investment trusts. The new but growing segment requires less capital expenditure than other real estate sectors, and retiring baby boomers are creating more demand in the face of a dwindling supply of parks. 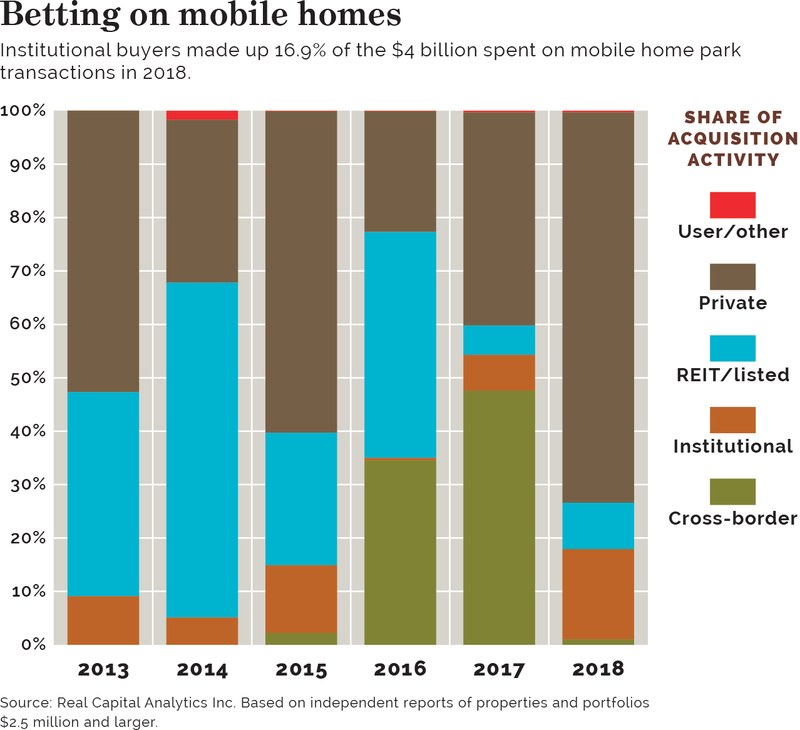 Although some existing parks have expanded, only 10 new mobile home parks have been built in the last two decades, according to PGIM Real Estate research, a unit of Prudential Financial Inc. And institutional ownership is tiny — 15% to 20% of the overall investment-grade market is owned by REITS, with only to 2% to 3% owned by other institutional owners. Approximately 5,000-6,000 manufactured housing communities in the U.S. are institutional quality. Residents typically own their mobile homes but rent the property from park owners. And because the structures themselves aren't really all that mobile, most homeowners tend to sell rather than move them, money managers say. That contributes to the stability of the cash flow. The Carlyle Group LP, Washington, is a big player in the mobile home segment. A Carlyle spokesman said the firm is particularly active in the California and Florida markets. "There are a lot of 'mom and pop' shops," a spokesman said. "There are a lot of communities in parts of the country we are looking at. … There is a lot of room for improvement." Carlyle aims to "reposition" the mobile home parks, many of which have been neglected by their owners to "make them nicer," the spokesman said. But the sector also can be a sensitive area because it's one of the largest areas of affordable housing. And residents say the rent increases are getting too high. Liz Voigt, co-director of advocacy group MHAction, said private equity and real estate firms have been investing more in manufactured housing in the past few years. Rising rents are the homeowners' central complaint, with some seeing increases of 10% to 20%, she added. A park in Sunnyvale, Calif., Plaza Del Rey, is an example. Residents of Plaza Del Rey say they feel stuck because Carlyle Group has been raising the rent 8% a year from 3% since it bought the park in 2015, said Judy Pavlick, a resident in the Sunnyvale park. Ms. Pavlick said that fee increases imposed by Carlyle are making it more difficult for residents to sell their homes. Carlyle Group executives acknowledge that they have raised rents to cover the capital improvements. But the firm also created a safety net program for residents that need help with the rent, the spokesman said. Of the 800 units at the Sunnyvale park, 21 residents have taken advantage of the program. Carlyle Group is not alone. Institutional money managers are responsible for a growing share of the transactions in the sector, according to Real Capital Analytics Inc., a real estate research firm. Institutional managers accounted for 17% of the $4 billion in transactions in 2018, up from 9% of the $1.2 billion in transactions in 2013. In July, Blackstone Group LP bought a portfolio of 14 manufactured housing communities for about $172 million from residential real estate manager Tricon Capital Group Inc. In June, the $28 billion Texas Employees Retirement System, Austin, committed $50 million to MH Legacy Fund II, a real estate strategy jointly managed by Federal Capital Partners and Horizon Land Co. investing in U.S. manufactured home communities. And in 2018, TPG acquired a portfolio of manufactured home communities operated by RV Horizons. A joint report by MHAction, the Private Equity Stakeholder Project and Americans for Financial Reform pointed out another attraction for real estate managers — the ability to finance their acquisitions through loans from the Federal National Mortgage Association. In recent years, Fannie Mae has offered financing for money managers buying mobile home communities as well as loans for residents purchasing the homes to promote affordable housing. TPG used a $200 million loan to help finance its RV Horizons portfolio, according to Fannie Mae. In the two years ended Sept. 30, TPG invested a total of $400 million in manufactured housing, according to a Fannie Mae report on the manufactured housing sector. TPG isn't the only investor in the manufactured home communities, Fannie Mae's industry report shows. Brookfield Asset Management, Toronto, was the largest investor in the two-year period, investing almost $2 billion in 134 manufactured housing community properties, the report showed. Yes Communities, a private REIT, invested $1.6 billion during the period. Singapore sovereign wealth fund GIC, which has long pegged the size of its investment portfolio at more than $100 billion, and the $54.9 billion Pennsylvania Public School Employees' Retirement System, Harrisburg, own a majority stake in Yes Communities. Government of Singapore Investment Fund alone invested $1.5 billion in manufactured housing in the two years ended Sept. 30, the Fannie Mae report noted. Blackstone Group invested $190 million and Carlyle invested $140 million in the same period. PGIM Real Estate has been investing in the sector for two years, said Lee Menifee, Madison, N.J.-based managing director and head of Americas investment research at the firm. PGIM executives and the operators it partners with generally maintain below market rents, Mr. Menifee said. "We are mindful that manufactured housing communities are a source of affordable housing and it is our intent to maintain them as affordable," he said. This should make manufactured housing a more durable investment over time, he said. The manufactured home sector is much like the fragmented self-storage sector was 10 to 15 years ago, he said. And that is serving as a template for manufactured housing — taking partners with expertise in the space and buying smaller properties to create a portfolio of assets. The challenge has been assembling a portfolio of scale, said Mr. Menifee. "Individually, these are not big assets," he said. "Accessing the sector efficiently is always the hard part." So far, "there are no standardized industry classifications yet, although some owners refer to properties along a spectrum ranging from 1 star (lowest quality) to 5 star (highest quality)," Mr. Menifee explained. "Most institutional ownership is concentrated in the 3 star and better segment, which means they were generally established after 1980, have density of 10 units per acre or less (sometimes as little as four units per acre for the highest quality), and have community amenities such as a clubroom or tennis courts." Once the properties are stabilized, the income allows the investment to move from value-added to core real estate portfolios, he said. "One of the key changes is that institutional interest has increased and so has pricing," he said. The market was less efficient two to three years ago, he added. Bernhard Krieg, Chicago-based managing director and portfolio manager in Brookfield Asset Management's public securities group, noted that institutional ownership is small but growing. Most of the properties are small and scattered across the country. Two REITs, Equity Lifestyle Properties and Sun Communities Inc., control about 1% of the 7 million manufactured homes located in parks and 15% of the 15,000 manufactured home communities are institutional quality, he said. The sector is attractive because it fulfills a need for affordable housing that arose after the global financial crisis, he said. "It's very much a land business, and there is a relatively low capital requirement."